One58 Country med influenser från blues, jazz och rock’n roll. Akustiskt, jordnära och ärligt, alltid med glädje… det är vi. One58 was formed 11th of April 2003 by Lena Mattsson, Roger Karlsson and Johnny Granström, in a very simple way and with true joy as a band around the ”kitchentable”. The band from Karlshamn consists of a couple of musicians with great routine of playing rock and blues covers. The band have longed for playing different kinds of real acoustic music inspired by country music. One58 thinks it’s important with powerful songs, lot of singing, harmonies and a down to earth sound. In many ways One58 are a bunch of heavy metal rockers who are fed up with carrying heavy Marshall amps and instead of that want to accomplish musical weight with acoustic instruments and vocals. Johnny and Roger were also playing together with the guitarist Kjell Jacobsson in the folklore band Cadence and occasionally the two groups met on the same venue and the same night during fall 2003. The gig inspired Kjell to listed more to country and bluegrass music. After a while the band asked him if he would like to join the band. Kjell turned on the new sound and joined the band. In September 2004 the band got a record deal with Wild Oats Records and went to Nashville to record the songs on the Flyin High Album. It was a great experience for the band and the Album were released in summer 2005. Together with the CD-release One58 also did the video ”Love will find a way” filmed and edited by Ari Hannila and Stefan Harrysson. One58 also recorded some songs at Sveriges Radio P4 in 2005. Kjell took a break with the band, fall 2006, due to family reasons and Anders Fernlund was substitute Kjell on guitar. In 2006 One58 won the price of Best Alternative Country Band at Country SM in Sälen. In 2007 One58 recorded the CD ”Yeah…I’m a Cowboy” with 10 songs. In 2008 the yearning was too long and Kjell joined the band again. One58 are performing at several of the most popular country festivals in Sweden and Denmark as well as church concerts or, why not, wild private parties. One58 is just love and pure joy of alternative country music and blue grass music with lyrics that talks directly to your heart. One58 is unresistible acoustic based power, with no drums, still heavily swinging! 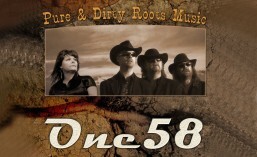 One58 delivers country songs like: Why you been gone so long, Drivin Wheel, The boots I came to town In, Sunny Side, Crazy, Storms never last, Down to the river etc. The list is very long. If you want, One58 also delivers well-known cover songs from 50-60-70-80-Decade of Music. Don’t be afraid of asking them to play your cover or some sing-alongs. Just write down a note of that song and post it in the hat of one of the boys and see what’s happens. Do you want a pleasant occasion? Then don’t miss their unforgettable energy and their pure live music! You are welcome booking your next event with One58!